They're holding two of our tankards plus a copy of my book. How sweet is that? As I post this, I have some homemade macaroni and cheese in the oven, a glass of wine at my elbow, Mozart on my Pandora station, and I will doubtless be in bed by 9 pm (my party days are long over). May God grant you all a blessed, healthy, and prosperous New Year, dear readers. As you all know, we have a Great Pyrenees named Lydia whom we love dearly. Lydia came to us courtesy of some wonderful breeders who used to live a couple hours away, Jim and Carol of Agape Ranch. Pyrenees were historically bred as livestock guard dog in the Pyrenees Mountains that straddle France and Spain. They are an ancient lineage and fierce defenders against predators, but gentle as lambs with their flocks. Since Lydia guards us, we have become her flock. Pyrenees aren't for everyone, as I explained in this post. We are fortunate in that our rural location as well as our previous experience with large dogs qualified us to get a beastie as wonderful as Lydia. I need some insight. Our Pyr, Sophie is 7 months old and I think she's hit the "horrible teen years" I hear everyone talk about. We've had her since she was 8 weeks old. She's developed a routine of sorts over the past few weeks that's driving me nuts. She stays out all night patrolling our 3/4 acre fenced in yard, with our dairy goats, chickens, and ducks all in their respective barns with enclosed runs so she doesn't have direct access to them. She's fine with the goats when I'm out there with her, but she thinks the poultry are chew toys. She's never killed one, but I've found more than one soaked with her slobber, so we now keep them all in covered runs. She comes in the house around 7am everyday, sleeps for several hours on the living room floor, wakes up, eats, I take her out on the leash to pee and then she comes back in. She then just hangs out with us, resting a little more and demanding attention off and on from me and my boys, usually belly rubs. Up to here, we're fine. What I'm having a problem with is she seems to be stalking in the house when I'm in the kitchen too long. We have a double wide modular home so it's not like she can't see me. The living room, dining room and kitchen are all open to one another. She moves from the living room into the dining room about half way toward the kitchen with her head down and her eyes looking up. If I come out of the kitchen and ask her whats wrong and head for the living room, she backs up and follows me, sits down in front of me and wants petted or buries her head in my lap and wants petted. If I don't come out of the kitchen, sometimes she'll just lay on the runner in the dining room until I do, but sometimes she'll give a really low grumble until I do. She doesn't have the Pyr smile I hear everyone talk about either, but then again, I'm not sure what it's suppose to look like either. She never has. Ever since she was 8 weeks old she has always had a somber look about her. Unless, she hits the randy, ornery, hyper part of the day that's driving me nuts! Somewhere between 2 and 4 in the afternoon she starts with the "I want out" "No I don't" part of the day. She'll go to the door and want out, but only to sit at the front of the house and scope out the back yard for several minutes and then pulls me back to the front door. We have to take her out the front door and down the side yard to the gate in the fence to let her out. She'll do this 3 or 4 times before I can get her to go back out into the yard. Then, if you go into the yard with her she's all hyper and jumpy and "play with me or I'll run circles around you until you do" kinda thing. Her stubborness seems to have blossomed overnight and with a vengence! Any insight into this behavoir would be much appreciated along with any suggestions. Thanks. Figuring I'd turn this over the the experts, I directed the comment to Carol at Agape Ranch. She not only responded, but also had other Pyr owners address the questions on a Pyrenees Facebook page. It seems to me Sophie is restless because she is a livestock guardian dog and she feels the need to be with those she has the job to protect. The fact that she spends nights outside and days inside may be confusing her. Also she should not have to be supervised with ANY livestock. If she is slobbering on the chickens, then she does not understand that she needs to be guarding them. She has not associated them with protection, only prey. Jen: I am a first pyr owner and what you have stated seems pretty typical of the breed. Mine is 5 months old and is so good during the day but around 6ish at night he turns into a wild man for about a few hours and then he settles down again. Mine has always had that "sad" look to him, we call him eeyore. lol I'm not sure about the poultry issue since I have no farm animals, but I do know when I visited my brother law mine was very excited/interested in his chickens. I think its just a time and patience thing unfortunately...just be consistent and she will out grow it. I once read a great Pyrenees is a labor of love and I do believe that is true especially for at least the first year...then you get the sweet, calm, gentle giant, lol. But I will say this too, the breed has won my heart over and I'll have at least one from this point on...to tell you the truth I want to get another soon, lol. Hope this might help some! Brenna: All normal puppy behavior for the most part. I would caution about letting her get near the chickens without supervision. From what I have read, most dogs should be be near fowl until they are at least 2 years old and even then some dogs just are not good with them. My pyrs get hyper two or three times a day, more so if it is cold outside and they really want us to play with them so we do. They aren't in to fetching so much so we run with them and toss their toys so we can all chase them. With the going out behavior, she is just gonna have to put her foot down. Either the pup goes out or she doesn't. Carolyn: This is very typical puppy behaviour. Our last two pups had mad hour between and 9:30 in the evening. We used plastic lemonade bottles and they would run and play with those. Pyrs do not do the fetch game like a gun dog would do. Remember they are natural guard dogs and will guard all night! I wouldn't let them near the chickens but then ours are not working dogs. Hope this helps. Becky: She sounds like she wants to play or have an activity where you go out and play with her. We take walks, hikes, or play a couple times a day and that seems to satisfy Bear. Bear is 2 and he is still quite demanding but exercise and play helps a lot! She is still quite a puppy even though she is probably big. I have also heard sometimes it just doesn't work out with pyrs and chickens.....it takes much supervised time, training and patience. Lisa: Typical Pyr puppy. She will grow out of a lot of those behaviors (but second the "keep her separated from poultry" folks). Francesca: Our two 5.5 month old puppies have what we call the "zoomies" at least twice a day..mid morning and again in the evening...pretty typical for puppies. Geralyn, I hope this helps as far as understanding your Pyr's behavior. Thanks for asking! Let's hear it for "despairing desolation"
Here's an interesting photographic essay that appeared on the United Kingdom's Daily Mail entitled Rural bliss... or despairing desolation? 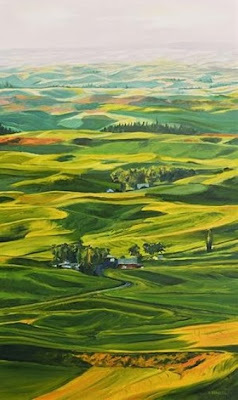 As it turns out, this English newspaper was depicting photographs of our backyard, namely the Palouse region. 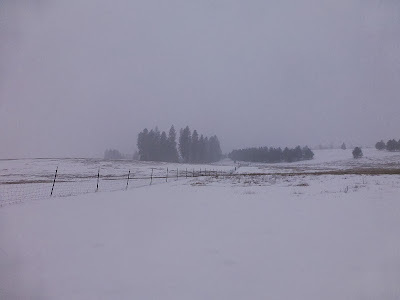 For those unfamiliar with it, the Palouse is a vast (about 3000 square miles), rolling, mostly treeless region that encompasses parts of eastern Washington and western Idaho. It's heavily agricultural, growing enormous amounts of wheat, lentils, and other dryland field crops. I had never heard of it until we moved to its borders, but now I'm enamored of it. 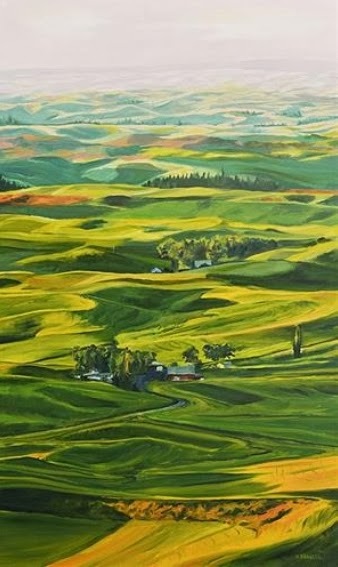 My gripe about this representation of the Palouse in such a far-away place as the U.K. is that it gives the people of that fine nation a misunderstanding of the true nature of our region. 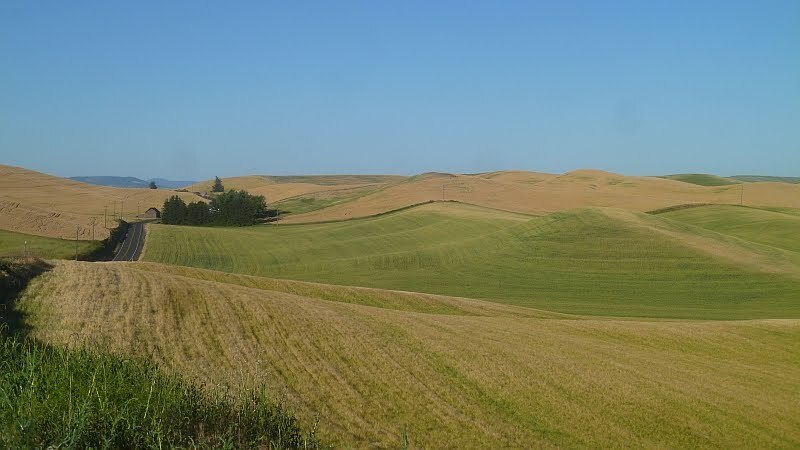 In reality, the Palouse is beautiful. Absolutely breathtaking. I suppose to those used to crowded urban areas, the vast rolling treeless hills could be considered "despairing desolation," but it's captured the attention of many, many renowned artists and photographers. Go into any local bookstore and there's usually a section devoted to photographic essays of the Palouse, depicting its beauty. Ironically the Daily Mail did feature some nice photographs of the Palouse a couple of months ago. I must say I prefer these photographic depictions over the other "despairing and desolate" ones. Or maybe I shouldn't praise the Palouse too highly. I guess those grim and despairing photos might help keep tourism down and keep our corner of the world quiet and undiscovered. I apologize for the blog silence of the last few days! The truth is, I've been lazy. No other excuse. So join us as we celebrate Christmas. 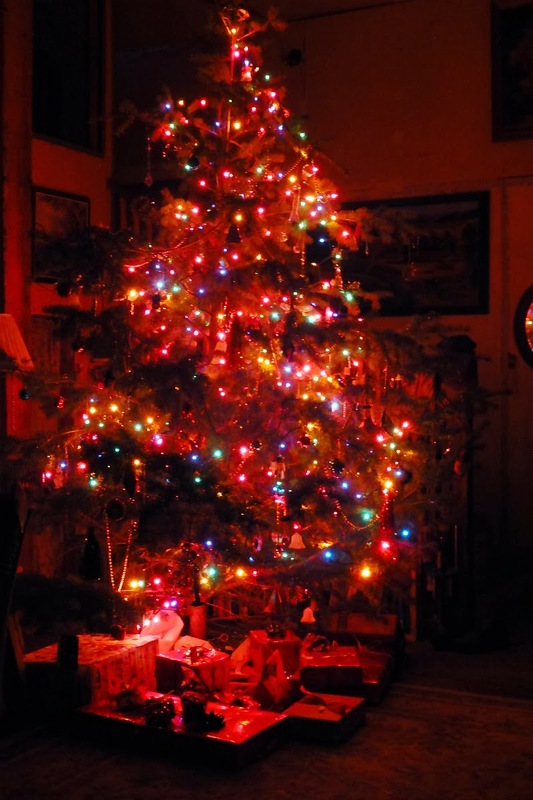 Our big celebration day is Christmas Eve. Early in the morning, long before dawn, I took this photo. ...and got ready for our annual Junk Food Feast. This is a congregation of every type of nutritionally-useless culinary rubbish we never, ever buy during the rest of the year. Long story short: After Thanksgiving many years ago, Don commented about what a pity it is I work so hard and make such a nice meal for Thanksgiving, only to repeat the same work load over Christmas. Somehow one thing led to another (aided and abetted by two eager children, no doubt) and before we knew it, we had started a tradition of having nothing but junk food for three days (Christmas Eve, Christmas Day, Boxing Day) in which no one has to ask permission to eat potato chips for breakfast -- and I go on a kitchen strike. It's kind of a silly tradition, but it's fun. The advantage of this technique is by the end of three days, the kids are begging for Brussels sprouts. Don't believe me? What do you think we had with dinner last night? Toward evening we made ready to greet some dear friends who always join us to open presents, a couple whose grown children live far away and always enjoy being with our kids. They've joined us every Christmas Eve since we moved to Idaho ten years ago, and the day wouldn't be the same without them. Don made sure he had his father's cherished Bible handy. ...Lydia interferes with the girls' concentration. Then one by one Don hands out presents. I tried to get a photo of some of Younger Daughter's presents, but the room was a bit too dark. However please note the pretty Victorian-style pleated choker that her older sister gave her, and which she adored. For the first time since moving to Idaho, we decided to attend church on Christmas Day rather than Christmas Eve. 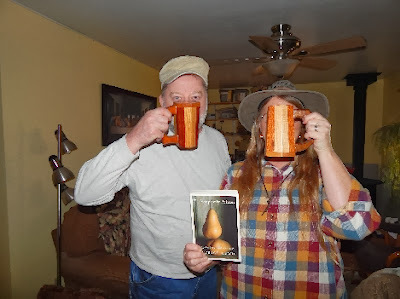 This meant we could linger over our gifts, having coffee and tea (and junk food), and enjoying the company of our neighbors. Early on Christmas morning, I put the girls' stockings and an additional gift or two in the front room, near the woodstove. Then I went out to feed the livestock. The day dawned clear, frosty, and beautiful. I saw large flocks of Canada geese overhead. We always feed the critters extra on Christmas Eve and Christmas Day, because legend has it that animals are granted the gift of speech on Christmas night. We don't want them complaining to the neighbors that they're ill-fed! We went to church, which was lovely. But after three Christmas Eve services, and one Christmas Day service, we can imagine the pastor was pooped. I can only hope he was able to relax and enjoy his family after church. Later in the afternoon, while getting ready for some friends to come visiting, I managed to vacuum up Younger Daughter's choker. Not her fault -- she had put it on the table, but later I gathered all the gifts and tucked them back under the tree, where a dangling tie sucked the whole thing up. Don had to disassemble the vacuum to extract it. It had some damage, but I think it's fixable. Ug. My bad. The day ended with a glorious display of color. A few days ago we had a pretty snowfall. I'm not sure the animals agreed, but after all it's their choice not to tuck themselves under the shelter of the barn awning. Nonetheless it was a very pretty snowfall. Even grungy old tractor tires -- awaiting their chance to be put in the garden next spring -- are transformed by snow. However a necessary hose, accidentally left undrained, caused problems. We hauled it inside to defrost. The view across the fields was vast. It was snowing so hard that it was difficult to avoid getting snowflakes on the camera lens. A solitary hen braves the white stuff. After slipping and falling several times on a sheet of ice inconveniently disguised underneath the snow, I parked this cart on top so we would avoid the bad spot. Major is easy to distinguish in this weather -- especially when he wears snow on his back. I went for a walk to admire the views. Ah well. As pretty as a white Christmas is, a brown Christmas certainly simplifies travel plans for those visiting others. In an effort to post made-from-scratch recipes for those readers who are just learning basic cooking, here's the recipe for Basic Spaghetti I made for Older Daughter's birthday dinner the other day. The nice thing about spaghetti is how flexible it is. You can add or subtract any number of ingredients to tweak it to your particular taste. It can be meaty or vegetarian; the pasta can be homemade, store-bought, whole-grain, spinach, or any combination; the sauce can have spices and additives (such as mushrooms, onions, etc.) adjusted to suit. It's a wonderfully versatile dish. In our particular case (or maybe I should say, in Older Daughter's particular case, since this was her requested dinner) I started with a pound of ground turkey. She doesn't care for ground beef (which is a pity, since we have so much of it when we butcher a steer) so we substituted ground turkey. The turkey was frozen, so I slowly browned it at low temperature as it defrosted in the pot. ...I assembled the other ingredients, in this case: canned tomatoes (my tomatoes didn't grow in last summer's garden so I didn't have any canned up) which I chopped up in a blender; tomato paste for thickness; salt, pepper, oregano, basil, and garlic for spices. I don't have a measure for the spices -- I just add things to taste. ...and then the spices. I also added a splash of vinegar and a pinch (quarter teaspoon perhaps) of sugar to offset the bitterness from the vinegar. The secret to any spaghetti sauce is to let it simmer for at least half an hour or longer. That way the ingredients blend for a better taste (many people say spaghetti sauce tastes better the next day). But while simmering, be sure to cover it. Spaghetti sauce is so thick that it won't "bubble" -- it will explode into miniature sauce-bombs that will splatter everything unless there's a lid on the pot. While the sauce is simmering, time to cook the pasta. If you're ambitious, you can make your own pasta from your own eggs and wheat. If you're short on time (or don't have a farm), pasta is cheap at the grocery store. I usually boil water first, then snap the spaghetti strands in half before dropping them in. A dollop of oil into the cook water will help keep the pasta from clumping, and it helps to stir it once in awhile. ...and ladle some sauce over it. We also enjoy sprinkling some Parmesan cheese on it. Voilà! A good hearty meal, especially on cold winter nights. Feel free to add your favorite variations on this theme. I figure this is what I'll do for readers who are novice cooks -- whenever I make a basic dish (and let's face it, most of my cooking isn't fancy) then I'll post it as a tutorial. What could possibly go RONG?